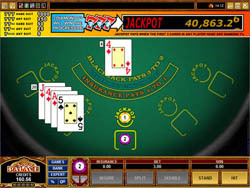 The rules in Triple 7’s Blackjack are more or less standard, with the biggest difference being a mandatory, 1 credit side bet made on every deal. Dealer always stands on all 17s. Splitting is allowed, but you cannot re-split. Should you choose to split aces, you can continue to draw, but drawing a 10 point card on a split ace results in 21, not blackjack. Doubling down, at a cost of 1x your initial bet, is available on hands totaling 9, 10, and 11. You cannot, however, double down after a split. No surrender is available, but you can purchase insurance if you like. Triple 7’s Blackjack is a Progressive Jackpot game, so some extra payouts apply! Betting uses any of 8 different chip sizes, and max bet is 200 Euro/USD/GBP. Blackjack pays out at 3:2, and insurance bets pay at 2:1. Every deal you must make a side bet of one credit. The Bonus Payouts are as follows, and apply only when the winning cards are the first cards dealt to you. Triple 7’s Blackjack uses Microgaming’s standard Blackjack engine, so you know it will look and play like a million bucks. The graphics are great, with realistic chips and a table that looks like it is really covered in green felt! The cards are a bit brighter and bolder than the rest of the images, so they stand out better, but don’t look quite as realistic. The upshot of this is that they are very easy to read, and you can speed through games as quickly as you’d like because of it. The game itself plays very nicely, with all the buttons positioned along the bottom, and the three you use most – deal, hit, and stand, are grouped right together to make everything as easy as pie. Because of the extra payouts in Triple 7’s Blackjack, you might be tempted to keep going after you see a seven in your hand. But remember, the payouts outlined above only apply when the first cards dealt to you are 7s. This means that if you get a 7 then a king, your bonus payout is 5:1, but if you get a King and then a 7 after it, you don’t get the bonus payout at all. If you get two 7’s, always hit, because you might get a third 7, hit 21, and win a big payout on top of it! Triple 7’s Blackjack is kind of like a combination between a great reel slot and classic blackjack, with 7’s paying big when you get them starting from your first card. The bonus payouts don’t happen too often, but they pay out big enough to make it worth it. Anyway the side bet is just one credit, so it’s not too bad at all. This is a great blackjack game, with some extra ways to win thrown into the mix – it’s just right!